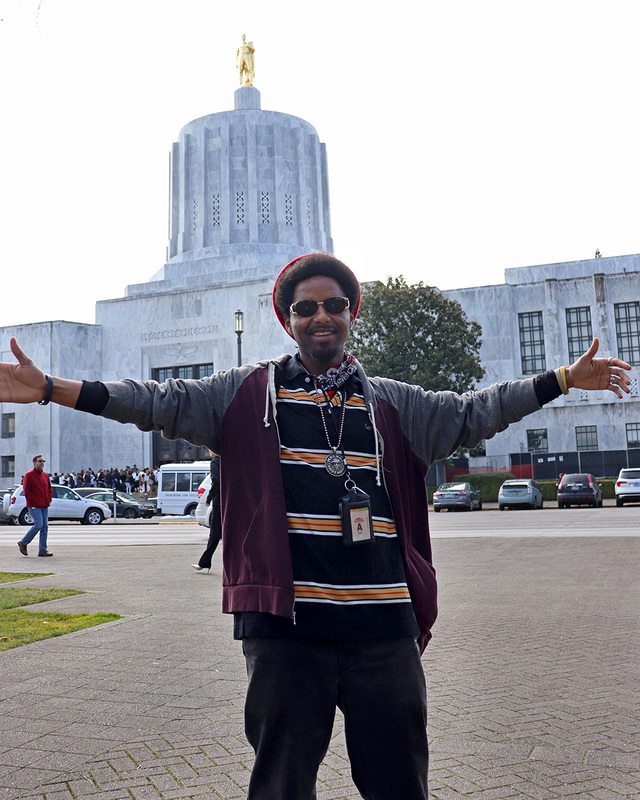 On March 14th, HomePlate joined advocates from all over the state to speak with legislators at the Oregon State Capitol for Housing Opportunity Day! This yearly event is planned by the Oregon Housing Alliance and brings people together who are passionate about seeking an end to the affordable housing crisis our communities are currently facing. HomePlate was represented by our Executive Director, Bridget Calfee, outreach workers, Joey Whiting and Hannah Kosel, as well as one of the youth we serve, EJ Radcliff. Our day began with a lobby training where we learned about the 2019 legislative housing agenda. Together, we were able to celebrate the recent victory of SB 608 (the first statewide rent control bill in the nation!) getting signed into law providing stability for many Oregonians who rent their homes. Going forward with positive momentum, we formed a small team with other advocates from Washington County and shared our passions for engaging in solutions for affordable housing not only through our work, but also how our experiences in our personal lives have shaped us to focus on finding justice for those who are unhoused or experience housing instability. We all had the wonderful opportunity to spend time in conversation with our elected representatives being honest with our frustrations while also sharing our successes in the work that is being done to end homelessness and our hope in a future for affordable housing throughout the state of Oregon. It was a powerful space for voices to be heard especially among our state leaders who hold so much power in their decisions they make for our communities. EJ and Joey were both able to share about their lived experiences and through his generosity, EJ made sure the stories of many of his peers were shared as well. It was a great day for our staff to continue our community outreach on a larger level as well as provide an opportunity for EJ to continue building his skills in advocacy for himself and those around him! To find out more about this year's housing agenda, visit www.oregonhousingalliance.org/2019agenda. Older PostBe Inspired by Dennis' Story of Recovery & Hope!